They shall endeavor to maintain 100% attendance. Absence is allowed only in case of ill-health.In case of ill-health, medical certificate has to be produced and parents may be called to the School. The students are to attend School punctually, in time. 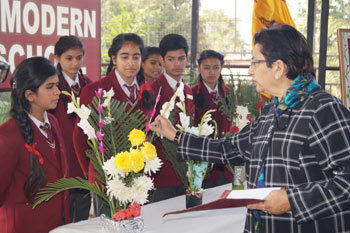 The students are to maintain proper uniform as per colour stitching prescribed by the school authorities. The students arte to maintain proper haircut as prescribed by the school authorities. No students is allowed to bring or meet any outsider within school hours, after or before school hours outside the campus. The use of of motorized vehicles, motorcycle, moped, scooter etc. is totally prohibited.Bringing of any motorized vehicle to the school automatically leads to terminations of admission. Students are to maintain discipline all times, They must obey their teachers. Any act of indiscipline will lead to termination of admission. The students must follow the code of conduct mentioned in the prospectus at all times. The school authorities reserve the right to cancel or terminate any admission at any time, for reasons related to obedience, academics, regularity etc. No leave from school is granted without prior approval of Principal. In case of three consecutive leaves without application, the student’s name shall be struck-off and re-admission charged. The principal will remain in the office on working days between 9.30 am to 10.30 am to grant an interview to the parents/guardians. Parents are advised to seek prior appointment over the telephone. The parents are requested to note that the Principal can not see anyone after this time or on Sunday/holidays. The parents are particularly requested be punctual on the above timings for meeting the Principal on appointments. Only parents and one guardian (whose name is mentioned in the admission form) can inquire about the students. 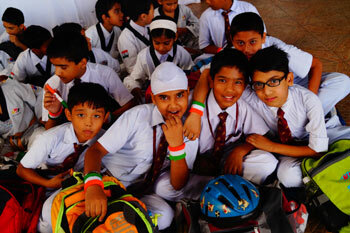 Parents are particularly requested to meet the Principal if the child’s performance in the tests is unsatisfactory. They must meet the Principal when called. All complaints should be submitted to the Principal’s office directly, in writing, not to any of the staff members.